I adore John Turner, not only from the fact that he’s coming to Glasgow Economic Forum in four weeks (get your tickets here! ), but for his great work in financial and economic history. Honestly, until April last year I didn’t even know he existed – borderline treason for those of us with an academic interest in financial history. As I stumbled upon his award-winning book, Banking in Crisis: The Rise and Fall of British Banking Stability, 1800 to the Present, I added it to my very long dissertation reading list. The extra push given by my advisor in September was enough for me to order it and read it. And what a read it was. Although the book is relatively short – 220 pages – it took me weeks to finish, for the simple fact that every single page contains valuable lessons, amazing reasoning and breath-taking insights that I simply had to jot down; my OneNote entry on the book is one of the largest I have and there are countless of individual entries in my vast Google Keep archive. [Turner] constructs a persuasive argument, one that demonstrates the value of economic and business history as a framework for exploring and finding solutions to contemporary economic problems. I agree with him completely, and would place particular emphasis on the first two chapters (the best 34 pages of your economics education – honestly!) containing an outlook of his case and all you need to know about the elementary problems of banking. He goes beyond that and sketches out the theory of risk shifting, “a more complete theory”, that better captures the “behaviour of bank owners and managers, who ultimately make the decisions about a bank’s exposure to risk.” (p. 23). For the rest of the book, Turner takes you on a venture through the dozen-or-so financial crises since 1825. He uses bank failures and movement in bank share prices vs. the overall stock markets to trace out major and minor crises, and briefly dives into the eight major ones with a couple of pages dedicated to each crisis – a perfect introduction for somebody with limited knowledge of 19th century financial crises. The rest of the book's chapters include more detailed discussions of lender-of-last-resort functions and Basel banking regulations, while a great overview for the initiated, may be a less-than-exciting read for normal people. So why should we care about banking? And moreso, why banking in history? Don't we have enough present banking issues on our minds? Banking crises are rare enough occassions that we need to look at many of them to trace out a pattern – such attempts thus involve history. Banks match lenders with savers ("provide intermediation of funds" in econ lingo), or as captured in a sentence: “Banking instability implies that these important services provided by banks are detrimentally affected, with potentially catastrophic consequences for both ordinary citizens and businesses” (p. 4). It’s a forceful justification on its own. He follows that discussion by supporting an interest in British banking in particular: Britain was first; British banking is believed to be more stable than other countries; Central banking pretty much originated here; minimal "statutory regulation of banking until 1979" makes recent development even more relevant; and finally the most important reason of all: British banking has mimicked many such developments in the rest of the world and may therefore provide insights and lessons applicable to other banking systems. It's a great representation for his entire work: insightful yet down-to-earth, easily explained and easily comprehended. The case is all-encompassing and gives a great overview to the study of banking problems, with Britain’s last two centuries as a case study. The basic case is this: banking can be kept stable and away from recurrent crises of various sizes in two ways: first, by extensive owner liability where share-holders are liable for more than the initial value of their shares – which ensures prudently-run banks – or second, by repressive government financial regulation that prohibits banks from advancing much funds to the private sector. The first one requires wealthy owners willing to take on that kind of extended liability, as well as a monitoring and screening process of owners that would be unthinkable in modern-day financial markets. The second carries a very high cost to society in terms of lost output and credit intermediation, invalidating the entire reason for a banking system. The lesson from two centuries of British banking stability is clear: one or the other is sufficient to ensure stability. Neither eventually means costly crises. I highly recommend his other work on limited liability and 19th century financial markets, but they deserve reviews of their own. 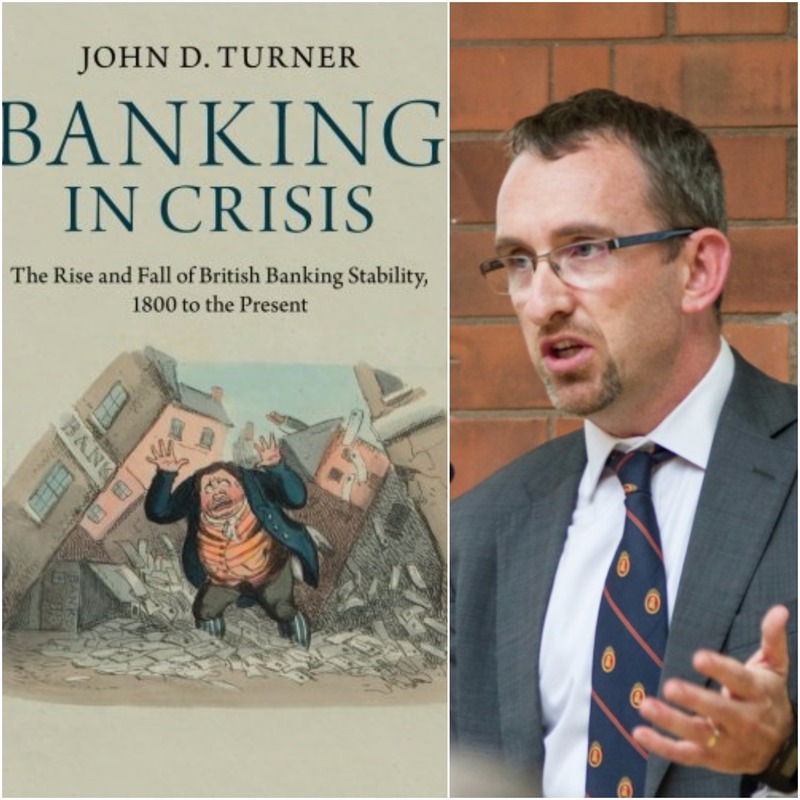 Until then, check out Turner's book – or even better, show up for Glasgow Economic Forum on March 11-12 to discuss the material with Professor Turner in person! Found this site via Mises....thanks for the excellent recommendations for further reading...hope you keep up the good work.